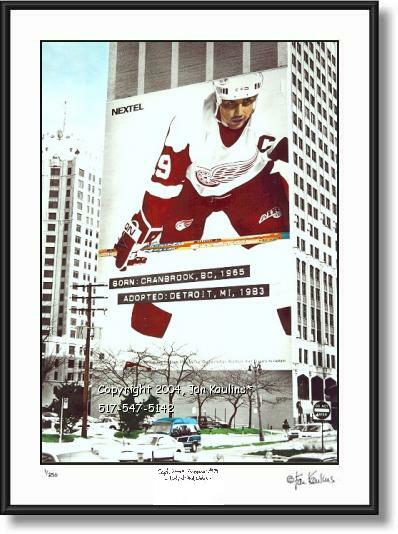 STEVE YZERMAN MURAL photo picture art print - DETROIT RED WINGS Capt. Steve Yzerman mural picture photo print - Detroit Red Wings Capt. Steve Yzerman #19 Mural picture photo print photograph for sale: This color Detroit Red Wings Steve Yzerman mural picture photo is made from an ORIGINAL BLACK AND WHITE PHOTO THAT HAS BEEN HAND-COLORED by artist/photographer Mr. Jan Kaulins. This Steve Yzerman photo is of the painted giant size Detroit Red Wing Steve Yzerman mural on the side of the Cadillac Tower office building featuring uniformed Captain of The Detroit Red Wings, for over sixteen years, Steve Yzerman. This original Steve Yzerman photograph of the three time Stanley Cup winner shows this huge mural in its Cadillac Square downtown Detroit surroundings. Steve Yzerman is a legend in his own time and will certainly go down as one of the all time great hockey players, not only of The Detroit Red Wings, but of the entire NHL. The Captain Steve Yzerman mural photo is a celebration of the man, his team, and The City of Detroit! Limited Edition artist signed and numbered Steve Yzerman #19 Detroit Red Wings mural photo for sale, Detroit Red Wings Steve Yzerman mural picture print for sale Capt. Steve Yzerman Mural downtown Detroit photo. please note: This photo is currently unavailable until further notice.